Field emission properties of transparent conducting nanocrystalline (~100 nm) Cd1-xSnxS thin films have been synthesized via radio-frequency magnetron sputtering technique for various Sn concentrations (0–12.6%) in the films. The optimum Sn concentration for obtaining maximum room temperature conductivity ~ 939.7 Scm-1 and mobility ~ 49.7 cm2V-1s-1, was found to be ~ 9.3%. Hall measurement showed very high carrier concentrations in the films lying in the range of 8.02 x 1018 cm-3 - 1.72 x 1020 cm-3. 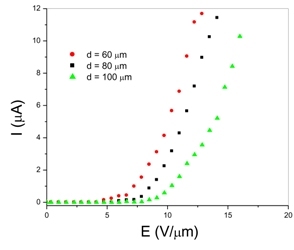 Cd1-xSnxS thin films show good field emission properties with turn-on field 4.74 – 7.86 Vμm-1 for variation of electrode distance 60 – 100 μm. There is almost no variation of turn-on field for different Sn concentrations in the films. The field emission data were analyzed using Fowler–Nordhiem theory and the nearly straightline nature of the F–N plots confirmed cold field emission of electrons. It was also found that the turn-on field decreased with the decrease of electrode distances.